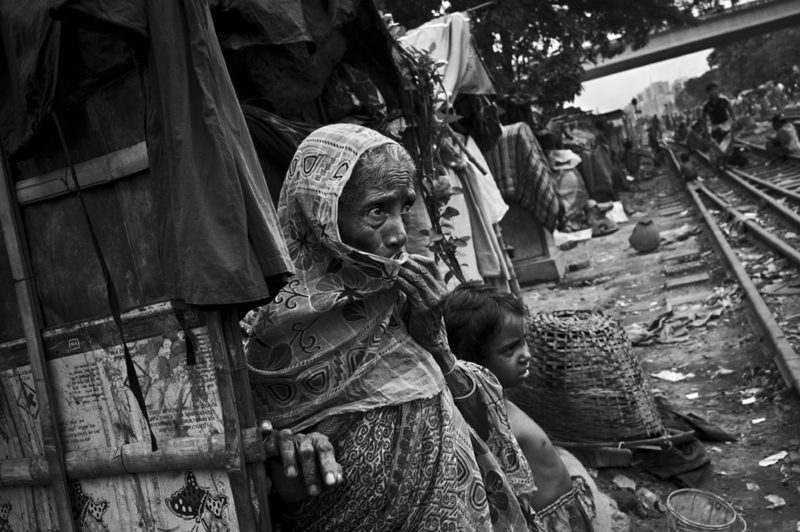 Bangladesh\nThe capital city has a population of about 16 million and has several slums spreaded all over the city. The city population is still growing due to the urban migration. Rural poverty, climate changes' consequences in the south and tensions in most of the border areas are the main reasons for people to move to Dhaka. \nIndia gov. considers the border wall as a protection against the Bangladeshi immigration. They welcome the Bangladesh elites but no exceptions for the "poor and uneducated" people as declared Indian authorities.\n\nJotona, 65, moved to Dhaka a week ago. She joined her son who lives in a slum for 30 years. She comes from the border region of Satkhira but she couldn't manage to live on her own in her home village. Her two other sons have some busines traffics with India and don't see them anymore because they have to hide from the Bangladesh Guards Border patrols. This slum is dangerous because of the trains passing right along the houses. Accidents with children and old people are not so rare.